Periodontal diseases, have a broad spectrum of inflammatory and destructive responses, and are thought to be multi-factorial in origin. Genetic variance has been considered as a major risk factor for periodontitis. With the advent of gene therapy in dentistry, significant progress has been made in controlling the periodontal disease and reconstruction of damaged periodontal tissue. A broad definition of gene therapy is the genetic modification of cells for therapeutic purposes. This approach is becoming possible owing to the increased understanding of the molecular basis for many diseases and the advances in the technology of gene transfer. The goal of gene therapy is to transfer the DNA of interest (for example, growth factor and thrombolytic genes) into cells, thereby allowing the DNA to be synthesized in these cells and its protein (termed recombinant protein) expressed [Figure 1]. Currently genetic principles are being applied along with tissue engineering for periodontal rehabilitation. This article reviews the fundamentals of gene therapy, and its implication in periodontal disease. The first gene therapy trials on humans began in 1990 on patients with Severe Combined Immunodeficiency (SCID). In 2000, the first gene therapy "success" resulted in SCID patients with a functional immune system. These trials were stopped when it was discovered that two of ten patients in one trial had developed leukemia resulting from the insertion of the gene-carrying retrovirus near an oncogene. In the case of germ line gene therapy, germ cells, i.e., sperm or eggs are modified by the introduction of functional genes, which are ordinarily integrated into their genomes. Therefore, the change due to therapy would be heritable and would be passed on to later generations. In the case of somatic gene therapy, the therapeutic genes are transferred into the somatic cells of a patient. Any modifications and effects will be restricted to the individual patient only, and will not be inherited by the patient's offspring. A carrier molecule called a vector must be used to deliver the therapeutic gene to the patient's target cells. Currently, the most common vector is a virus that has been genetically altered to carry normal human DNA. Viruses have evolved a way of encapsulating and delivering their genes to human cells in a pathogenic manner. Scientists have tried to take advantage of this capability and manipulate the virus genome to remove disease-causing genes and insert therapeutic genes. Herpes simplex viruses: A class of double-stranded DNA viruses that infect a particular cell type, neurons. Herpes simplex virus type 1 is a common human pathogen that causes cold sores. Another non viral approach involves the use of an artificial lipid sphere with an aqueous core. This liposome, which carries the therapeutic DNA, is capable of passing the DNA through the target cell's membrane. Trial treatments of SCID have been gene therapy's only success; since 1999, gene therapy has restored the immune systems of at least 17 children with two forms (ADA-SCID and X-SCID) of the disorder. Short-lived nature of gene therapy: Before gene therapy can become a permanent cure for any condition, the therapeutic DNA introduced into target cells must remain functional and the cells containing the therapeutic DNA must be long-lived and stable. Problems with integrating therapeutic DNA into the genome and the rapidly dividing nature of many cells prevent gene therapy from achieving any long-term benefits. Patients will have to undergo multiple rounds of gene therapy. 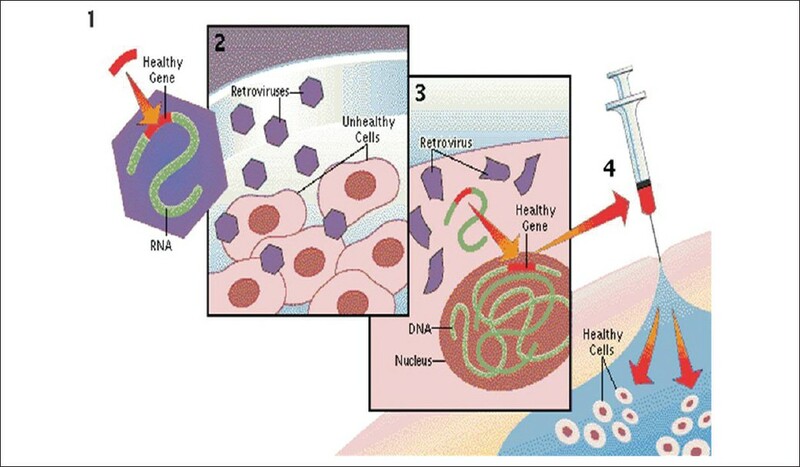 Activation of immune response: Viral vector may be recognized as antigen and leads to activation of immune response. This may lead the efficacy of gene therapy and can induce serious side effect. Chance of inducing a tumor (insertion mutagenesis): If the DNA is integrated in the wrong place in the genome, for example in a tumor suppressor gene, it could induce a tumor. This has occurred in clinical trials for X-linked severe combined immunodeficiency (X-SCID) patients, in which hematopoietic stem cells were transduced with a corrective transgene using a retrovirus, and this led to the development of T cell leukemia in 3 of 20 patients. Safety of vector: Viruses, the carrier of choice in most gene therapy studies, present a variety of potential problems to the patient toxicity, immune and inflammatory responses, and gene control and targeting issues. In addition, there is always the fear that the viral vector, once inside the patient, may recover its ability to cause disease. Difficulty to treat multigene disorders: Conditions or disorders that arise from mutations in a single gene are the best candidates for gene therapy. Unfortunately, some of the most commonly occurring disorders, such as heart disease, high blood pressure, Alzheimer's disease, arthritis, and diabetes, are caused by the combined effects of variations in many genes. Multigene or multifactorial disorders such as these would be especially difficult to treat effectively using gene therapy. Expensive: Gene therapy is costly and very expensive procedure. There have been tremendous advances in gene therapy relevant to dentistry since 1995. Even in the field of periodontics, it has been studied extensively. Currently genetic principles are being applied along with tissue engineering for periodontal rehabilitation. Approaches for regenerating tooth-supporting structures (A) Guided tissue regeneration uses a cell occlusive barrier membrane to restore periodontal tissues. (B) Alternatively, an example of gene therapy uses vector-encoding growth factors aimed at stimulating the regeneration of host cells derived from the periodontium [Figure 2]. To overcome the short half-lives of growth factor peptides in vivo, gene therapy that uses a vector that encodes the growth factor is utilized to stimulate tissue regeneration. So far, two main strategies of gene vector delivery have been applied to periodontal tissue engineering. 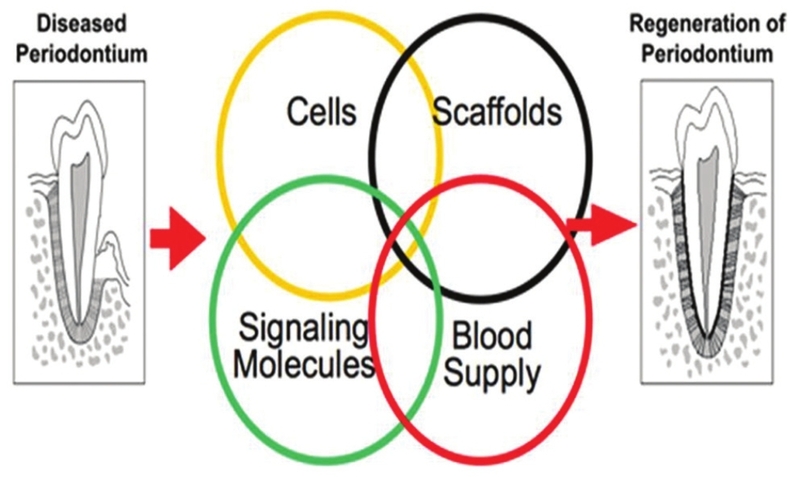 Gene vectors can be introduced directly to the target site (in vivo technique) or selected cells can be harvested, expanded, genetically transduced, and then reimplanted (ex vivo technique). 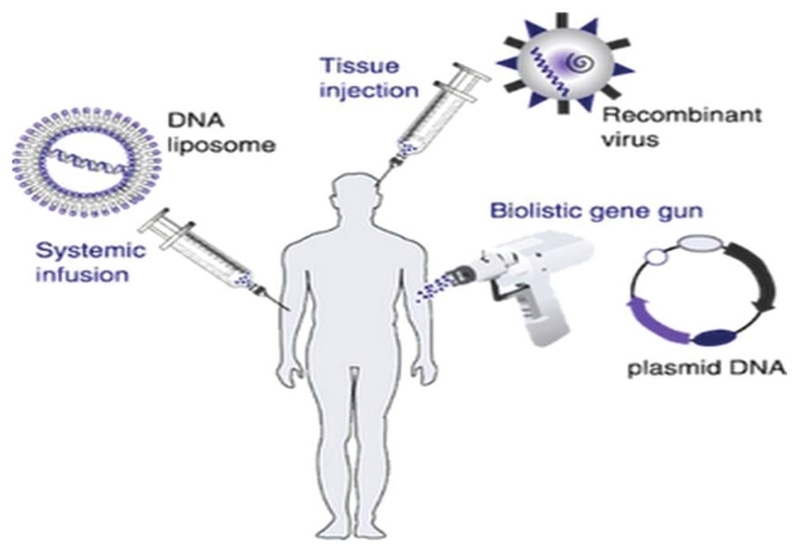 Gene therapy is done by targeting the gene delivery system to the desired cell type in the patient using either physical means such as tissue injection (brain tumor) or biolistics (dermal DNA vaccination), or potentially in the future, using systemic infusion of cell-specific receptor-mediated DNA carriers (reconstructed liposome's or viruses). Importantly, neither of these gene therapy strategies involve reproductive germline cells nor therefore the genetic alteration will not be transmitted to the next generation. In many countries, human germ line gene therapy is considered unethical or even illegal [Figure 2]. 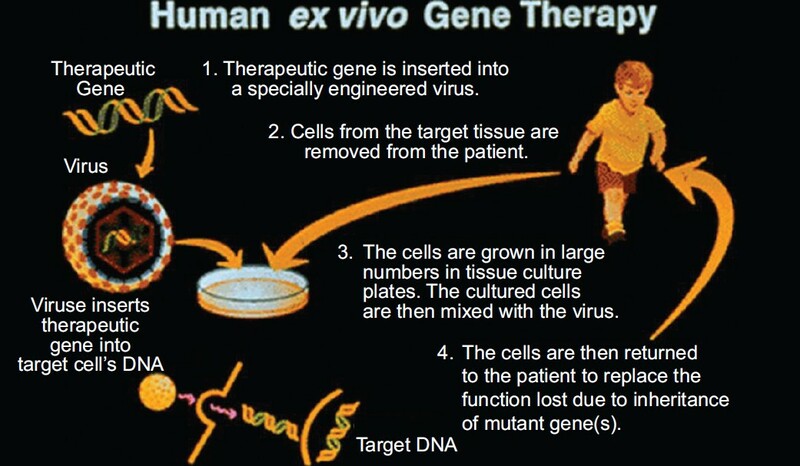 Ex-vivo gene therapy is performed by transfecting or infecting patient-derived cells in culture with vector DNA and then reimplanting the transfected cells into the patient. Two types of ex-vivo gene therapies under development are those directed at fibroblasts and hematopoietic stem cells [Figure 3]. The application of PDGF-gene transfer strategies to tissue engineering originally was generated to improve healing in soft tissue wounds, such as skin lesions. But, recently various trial have been done PDGF using Plasmid  and Ad/PDGF gene deliver,  for regeneration of periodontal tissue. The general strategy of tissue engineering is to supplement the regenerative site with a therapeutic protein like growth factors. However the problem with the delivery of growth factor is its short life. This is due to protelytic breakdown and receptor mediated exocytosis and solubility of delivery vehicle. 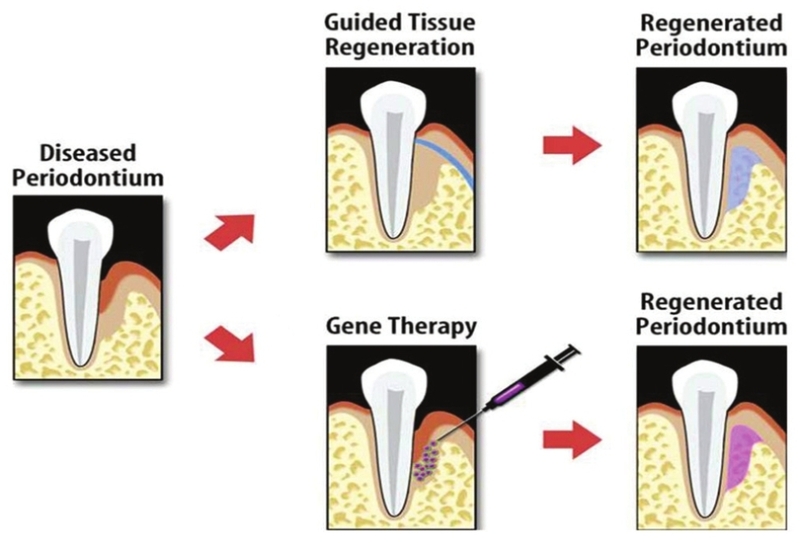 To overcome these problems, gene therapy has been developed which provides long term exposure of growth factor to periodontal wound [Figure 4]. A salivary gland of a mouse when immunized using plasmid DNA encoding the Porphyromonas gingivalis P. gingivalis) fimbrial gene produces fimbrial protein locally in the salivary gland tissue resulting in the subsequent production of specific salivary immunoglobulin's A, or IgA and immunoglobulin G, or IgG, antibodies and serum IgG antibodies. This secreted IgA could neutralize P. gingivalis and limit its ability to participate in plaque formation. Researchers have found bacteria growing in biofilms become up to 1,000 fold more resistant to antibiotics as compared to a planktonic counterpart making them hard to control. Recently Mah et al., identified gene ndvB  encoding for glycosyltransferase required for the synthesis of periplasmic glucans in wild form of Pseudomonas aeuroginosa RA14 strain. This remarkably protected them from the effects of antibiotics biocides, and disinfectant [Figure 5]. 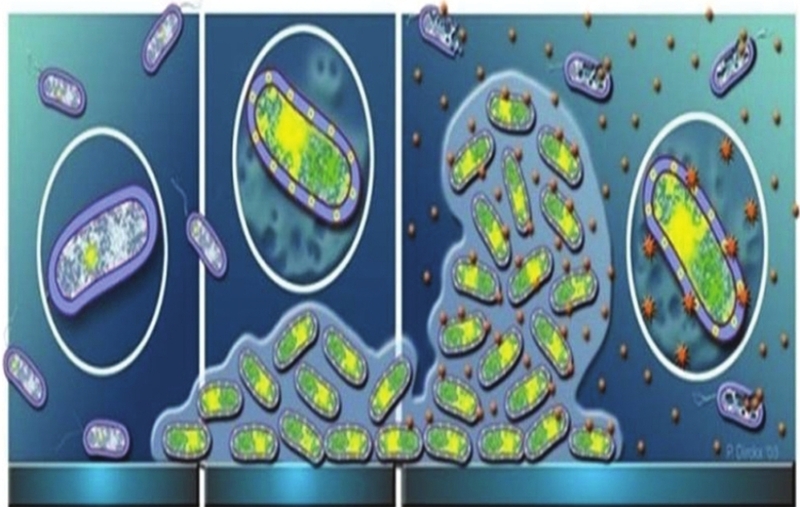 Researchers have isolated ndvB mutant of Pseudomonas aeuroginosa still capable of forming biofilm but lacking the characteristic of periplasmic glucans there by render- ing microbial communities in biofilm more susceptible to conventional antibiotic therapy [Figure 6]. 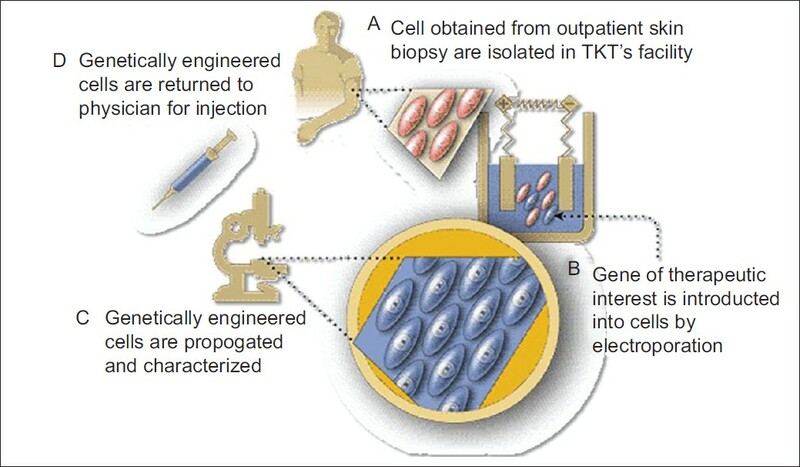 Step D- Genetically engineered cells are returned back to clinician [Figure 6] and [Figure 7]. Researchers have shown when host cells were infected in vivo with β defensin-2 (HBD-2) gene via retroviral vector; there was a potent antimicrobial activity which enhanced host antimicrobial defenses. If genes necessary for normal development are known, then "designer drug therapies" aimed at one area of the gene or the other can be developed. These designer drugs will be safer than today's medicines because they would only affect the defect in a gene clearly identified through genetic research. Gene therapy has a promising role in the field of periodontics but it does encompass serious ethical issue to be dealt with. It is evident that gene therapy has emerged from its stage of infancy of mere theoretical and hypothetical quotations to factual scientific researches, which reveals potential hopes. There are still lots of research and details of mechanisms to be understood to include these practically in day to day treatment modalities. 1. Kinane DF, Shiba H, Hart TC. The genetic basis of periodontitis. Periodontol 2000 2005;39:91-117. 2. Human Genome Project Information. Available from: http://www.genomics.energy.gov. Clinical Genetics-Kaya Lahiri. [Last accessed on 2012 Aug 2]. 3. Friedmann T. The maturation of human gene therapy. Acta Paediatr 1996;85:1261-5. 4. Baum BJ, Kok M, Tran SD, Yamano S. The impact of gene therapy on dentistry: A revisiting after six years. J Am Dent Assoc 2002;133:35-44. 5. Baum BJ, O′Connell BC. The impact of gene therapy on dentistry. J Am Dent Assoc 1995;126:179-89. 6. Parekh-Olmedo H, Ferrara L, Brachman E, Kmiec EB. Gene therapy progress and prospects: Targeted gene repair. Gene Ther 2005;12:639-46. 7. Muramatsu S, Tsukada H, Nakano I, Ozawa K. Gene therapy for Parkinson′s disease using recombinant adeno-associated viral vectors. Expert Opin Biol Ther 2005;5:663-71. 8. Lakshminarayana P. Vectors in gene therapy. In: Lakshminarayana P, Laxmi S, Editors. Medical genetics. 1 st Ed, Paras, 2008. 9. Morgan RA, Dudley ME, Wunderlich JR, Hughes MS, Yang JC, Sherry RM, et al. Cancer regression in patients after transfer of genetically engineered lymphocytes. Science 2006;314:126. 10. Ott MG, Schmidt M, Schwarzwaelder K, Stein S, Siler U, Koehl U, et al. Correction of X-linked chronic granulomatous disease by gene therapy, augmented by insertional activation of MDS1-EVI1, PRDM16 or SETBP1. Nat Med 2006;12:401-9. 11. Brown BD, Venneri MA, Zingale A, Sergi Sergi L, Naldini L. Endogenous microRNA regulation suppresses transgene expression in hematopoietic lineages and enables stable gene transfer. Nat Med 2006;12:585-91. 12. Gene therapy first for poor sight". BBC News. May 1, 2007. Retrieved May 3, 2010. 13. Maguire AM, Simonelli F, Pierce EA, Pugh EN Jr, Mingozzi F, Bennicelli J, et al. Safety and efficacy of gene transfer for Leber′s congenital amaurosis. N Engl J Med 2008;358:2240-8. 14. Available from: http://www.nature.com/news/2009/090916/full/news.2009.921.html [Last accessed on 2012 Aug 2]. 15. Jocelya K. Seeking the cause of induced leukemia in X-SCID trial. Science 2003;299;495. 16. Jin QM, Anusaksathien O, Webb SA, Rutherford RB, Giannobile WV. Gene therapy of bone morphogenetic protein for periodontal tissue engineering. J Periodontol 2003;74:202-13. 17. Lee JY, Peng H, Usas A, Musgrave D, Cummins J, Pelinkovic D, et al. Enhancement of bone healing based on ex vivo gene therapy using human muscle derived cells expressing BMP-2. Hum Gene Ther 2002;13:1201-11. 18. Baum BJ, O′Connell BC. The impact of gene therapy on dentistry. J Am Dent assoc 1995;126:179-89. 19. Crombleholme TM. Adenoviral-mediated gene transfer in wound healing. Wound Repair Regen 2000;8:460-72. 20. Hijjawi J, Mogford JE, Chandler LA, Cross KJ, Said H, Sosnowski BA, et al. Platelet-derived growth factor B, but not fibroblast growthfactor 2, plasmid DNA improves survival of ischemic mucocutaneous flaps. Arch Surg 2004;139:142-7. 21. Printz MA, Gonzalez AM, Cunningham M, Gu DL, Ong M, Pierce GF, et al. Fibroblast growth factor 2-retargeted adenoviral vectors exhibit a modified biolocalization pattern and display reduced toxicity relative to native adenoviral vectors. Hum Gene Ther 2000;11:191-204. 22. Zhu Z, Lee CS, Tejeda KM, Giannobile WV. Gene transfer and expression of platelet-derived growth factors modulate periodontal cellular activity. J Dent Res 2001;80:892-7. 23. Anusaksathien O, Jin Q, Zhao M, Somerman MJ, Giannobile WV. Effect of sustained gene delivery of platelet-derived growth factor or its antagonist (PDGF-1308) on tissue-engineered cementum. J Periodontol 2004;75:429-40. 24. Jin QM, Anusaksathien O, Webb SA, Rutherford `RB, Giannobile WV. Engineering of tooth- supporting structures by delivery of PDGF gene therapy vectors. Mol Ther 2004;9:519-26. 25. Anusaksathien O, Webb SA, Jin QM, Giannobile WV. Platelet- derived growth factor gene delivery stimulates ex vivo gingival repair. Tissue Eng 2003;9:745-56. 26. Kaiger D, Cirelli JA, Giannobile WV. Growth factor delivery for oral and periodontal tissue engineering. Expert Opin Drug Deliv 2006;3:647-62. 27. Franceschi RT, Wang D, Krebsbach PH, Rutherford RB. Gene therapy for bone formation: In vitro and in vivo osteogenic activity of an adenovirus expressing BMP-7. J Cell Biochem 2000;78:476-86. 29. Sharma A, Honma K, Evans TR, Hruby DE. Oral immunization with recombinant Streptococcus gordonii expressing Porphyromonas gingivalis Fim A Domains. Infect Immun 2001;69:2928-34. 30. Katz J, Black KP, Michalek MS. Host response to recombinant hemagglutinin B of Porphyromonas gingivalis in an experiment rat model. Infect Immun 1999;67:4352-59. 31. Mah TF, Pitts B, Pellock B, Walker GC, Stewart PS, O′Toole GA. A genetic basis for Pseudomonas aeruginosa biofilm antibiotic resistance. Nature 2003;426:306-10. 32. Tsuchiya S. Gene transfer into periodontal tissue by in vivo electroporation. 2002. Available from: http://www.Iadr.confex.com. [Last accessed on 2012 Aug 2]. 33. Schreiner HC, Sinatra K, Kaplan JB, Furgang D, Kachlany SC, Planet PJ, et al. Tight-adherence genes of Actinobacillus actinomycetemcomitans are required for virulence in a rat model. Proc Natl Acad Sci 2003;100:7295-300. 34. Cathy AJ. Teeth-We′re going to grow them back! Available from: http://www.Filipinodentist.Com. [Last accessed on 2005 April 17].